Defunct Audio Manufacturers - Q to Ral - audiotools.com. QUAD See --> Acoustical Manufacturing Co. The company was formed in 1995 when investors that took over the Ampex Recording Media Corporation division of Ampex. They made mostly specialised blank tapes and disks for the pro-audio and for the scientific/engineering community but also a range of consumer tapes. By 2004 the company was down to 250 employees. Quantegy shut down its operations on December 31, 2004 and filed for Chapter 11 bankruptcy protection on January 4 the year after. Company formed in 1968 by Jacob Rabinow to manufacture a linear tracking arm that he invented, there were problems with the arm and it's manufacturea from the start and Mr. Rabinow more or less gave up on the idea and sold his company to Harman Kardon in 1972, they continued selling the arm and even turntables using this brand for a few years afterward but discontinued its use in 1980 when HK was taken over by Shin Shirasuna. Company based in Bedford, Bedfordshire, England that was a fairly well known manufacturer of low budget radio kits in the 1960's and 70's that primarily sold through mail order via adverts in hobbyist electronic magazines such as Practical Electronics. We do not know the actual timeline of the company but it is advertising in the early 60's and has disappeared by the mid 80's. The operation had a store in a back alley just off the Bedford high street that in addition to selling their own products appears to have retailed new and second hand radios, electronic components and related paraphernalia. It cannot have been more than a one or two man operation in the beginning, early adverts featured a rather convoluted and in retrospect rather funny directions to their address that begun by asking you to go behind the shoe store on the High Street and then perform a few further hops until you reached the Nirvana of budget radio DIY and reminded you of the sort of directions to the lairs of nefarious characters that you read in kid's adventure novels or spy thrillers from the 1910's . The best selling kits they had were the Transona series of budget radio kits, but these featured simple five or six transistor circuits coupled with a small transformer push-pull output stage, but in the early 60's a small transformer was cheaper than a transistor and thus often seen in budget outputs. The term usually brandished about by people that built these when discussing their products on forums is "disappointment", although that is actually a slightly unfair towards the Transonas, they were the cheapest radio kits available in the UK and as such more intended as an educational project rather than competing with a fully built retail unit, there were after all small handheld radio receivers available on the British market that cost less than the Transona kit retailed even as early as 1961. The cheapest kit available from Radio Exchange was the Transona Five that in 1964 cost only 42/6 (2.13 pounds in decimal currency) and while the most expensive model from the company was the Roamer Seven MkIII cost 5 pounds, 19 shillings & sixpence, but by the 1970' the company was still selling the Transona and Roamer models but the price difference had changed, by then the Transonas cost less than cost less than 1/4th of what the most expensive roamer was priced at. To put the price of the RE products into perspective, in 1964 the Transonas were less than half the price of the cheapest kits from most their competitors and they were even less expensive than the the Sinclair Radionics micro-radio kits, but those kept the costs down by utilising semiconductors that performed under specifications and were sold to Sinclair by manufacturers considerably cheaper than normal transistors but unmarked. By the early 70's the company had entered the educational kit market and appears to survive into the latter half of the 70's at the least even though the market for kit radios had all but disappeared. Radiotechnic Laboratories See --> Pierce Wire Recorder Corp. Founded in 1936 in Wien when the Austrian arm of Philips took over the bankrupt Vindobona company. This turned out to be a smart move on Philips part as they were the main creditor and supplier of the original company and would thus have lost out if the company had not survived, further more the Hornyphon brand had become well known in Germany and Britain in addition to being by far the biggest supplier of radios etc. in Austria, and despite the financial problems Vindobona had suffered the RH company became profitable soon after production was restarted. From its founding and until 1947 the company was mostly occupied with the manufacture of its own products but after that period Philips increasingly began to integrate the sales and branding of the various companies they owned world-wide and Philips products began to appear in Austria branded Hornyphon and products from RH were increasingly sold outside of its home country branded as Philips, by the 1960's the Hornyphon name had all but disappeared except as a local brand. The factories continued however and were for a time the main source of certain tape recorders lines from Philips, their excellent but seldom seen professional tape recorders were for instance designed and manufactured at the RH factory and later some video recorder lines were produced there as well. The usage of the Hornyphon trademark appears to have been dropped in the 1980's and I have not been able to find out for certain if the factory is still going but I believe it was one of the factories that disappeared in the "Rationalisation Programme" of Philips in the early 1990's, when the company sold and shut down a large number of product lines, technologies and factories in an effort to simplify its management and financial structure (remember "downsizing" was the business buzzword of the late 80's, early 90's). Despite what you might think the Horny and Hornyphon names did not have any negative or "entertaining" connotations in English at the time when the company's products were at their most popular as an export product (1930's), the company's main export markets were actually the English speaking world, in particular portable gramophones and radios from the company were popular with the English expatriates that were working in various corners of the British empire since they used more standardised parts, were more easily repairable and had a wider tuning range than the equivalent British product not the least due to the use of better passive parts that withstood extremeties in humidity better. It appears that slang usage of the word "horny" was limited to the former colonies in America until the 1970's. A small UK based specialist hi-fi store originally founded in 1973, they are listed here since for a time in the 1980's they sold modified phonographic pickups, primarily EMT-Franz units. The shop is still around and is probably the last example of the "Flat Earth" stores that is still open, these sprung up in the 70's and 80's and where a sort of a jingoistic reaction to the increasing number of imports in normal hi-fi stores, Radlett to this day carries only one brand that is not nominally British. Founded in 1947 in Danzig, Poland as a radio workshop, operated throughout the communist years as a radio and communications equipment manufacturer under the name of Zaklady Radiowe Radmor and had a line of hi-fi separates that were sold locally under the Unitra brand and after the privatisation in the early 90's under their own name. Exited the audio business in the 90's to concentrate on manufacturing communications equipment, changed their name to Radmor S. A., and is one of the success stories of the new Polish economy. Small manufacturer based in Worthing, Sussex, England around 1970, despite the name the company made mostly home hi-fi products and loudspeakers are the only products with this name that I have seen on the second hand market. Danish manufacturer of loudspeakers founded by Michael Børresen in 2003 and was based in the town of Aars in Vesthimmeland municipality, in Nordjylland. Initially selling its products under the Eben brand the company later changed that to something more akin to a model number or series name and emphasised the Raidho name more as a brand. Their first line of high end loudspeakers called the "X-Streme Series" almost immediately gained interest not the least due to the drivers the company made but Raidho bought the cabinets from furniture manufacturers but manufactured the drivers themselves, which the opposite of what most small high end manufacturers do. More than that the drivers were also unusual, all their speakers used the same tweeter in the form of the FTT75 but that is a wide dispersion planar driver that uses a ribbon as a diaphragm (but is not strictly speaking a ribbon driver) and was used for both the upper mid-range and for the high frequencies but the crossover was set at 3.5kHz and the driver said to be able to operate up to 50kHz. But even though ribbon tweeters were nowhere as common a sight in 2003 as they are now it was still the main woofers that raised eyebrows, the company bough in motors magnets and caskets from Audio Technology but inserted their own ultra rigid propylene cones that made what the company claimed were the fastest woofers available. The X series comprised of the "X-1" 2 way bookshelf/stand-mount, the "X-2" that is a compact 2 way, 3 driver floorstander, the "X-3" is a 3 way 6 driver floorstanding model, the "X-4" is also a 3 way model but has 7 drivers in total with 2 mid-range woofers and 4 bass drivers and the top of the line models was the X-5 which sported the same driver configuration as the X-4 but had a larger baffle and drivers. And we are talking seriously high end here, the X-5 retailed for something like 100k USD in the USA in 2006 and has a quoted FR range from 15Hz to 50kHz. One of the more interesting models from the company though was the "X-Centric", a 2 way model that had 2 woofers and a tweeter in a D'Appolito configuration that was sold both as a centre speaker for a home theatre system and as a pair to be used as a standmounter, although it did not sell in the same quantities as the smaller X-1 many felt it to be the best bang for the buck amongst the line-up when used as monitors. At the beginning of 2005 Raidho introduced the "Emilie" series (Later renamed the S series) that was largely similar to the X but featured simple baffles and a new driver developed entirely in-house that placed emphasis on the weight of the driver to get a faster response speed, for that reason the cones of the woofer were made out of untreated paper, the voice coil out of aluminium and the basket out of magnesium, the tweeters remained the same as in the X series. In December 2007 the company introduced a revolutionary new series of speakers in the form of the "Ayra C series" (Later just "C series"), these featured a new baffle design where the front baffle and the driver casket were the one and the same structure, the cones were made out of ceramics and featured massive magnets in the motor and while the ribbon-like tweeter was mostly unchanged it had a been beefed up with a stronger and more evenly spread motor structure. The ceramic cones were eventually shipped with all speaker models from the company. Although the new Ayra C series generated a huge interest in the audiophile community the introduction came just before the financial system of the world started to implode and like many other high end companies Raidho was hit unusually hard by the financial problems of 2008 and was taken into bankruptcy in 2009, and had been dissolved by 2010. A saviour came from an unlikely source in the form of Danish budget audio and CE company Dantax that bought the Raidho company lock stock and barrel in 2009, unusually enough, but usually in these bankruptcy cases the potential suitors only purchase selected assets, Dantax however hired all the original staff of the company and simply moved the factory to its headquarters in Pandrup and continued operations as if nothing had happened. Spares & service : The Dantax company offers a full line of spares and offers repairs services for older Raidho & Eben speakers. 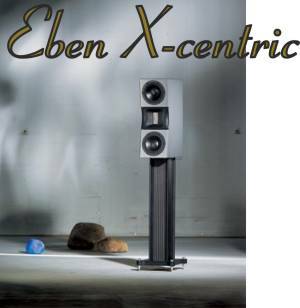 Resources: -- A review of the Eben X-3 from The Absolute Sound magazine.